The Espresso Medicine Cabinet is a must-have addition to your bathroom. It is sleek enough to match contemporary design, but its deep espresso finish matches with homey decors as well. The Espresso Medicine Cabinet features three, 5” deep shelves to disguise your bathroom clutter. A bathroom medicine cabinet is a great storage solution above any bathroom vanity, especially in a small space. This solid wood medicine cabinet hinges on the left hand side. The mirrored door is trimmed with the espresso toned wood from which the rest of the cabinet is constructed. Models that come with the same finish are 5060S3-EsW, 6070D6-EsW, 6070D7-TW, 6070D9-EsW/EsT, and 6070D10-EsW/EsB. This product can only be shipped with the purchase of the above mentioned vanity cabinets. 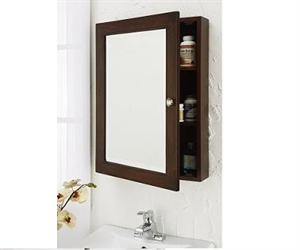 Complete your bathroom vanity with the Espresso Medicine Cabinet.